Here you can see our smaller Amish made pantry cabinet opened up. 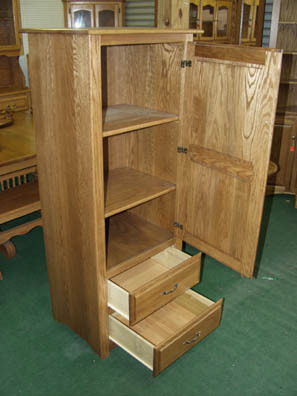 The picture shows you the two adjustable oak shelves, and the hinges holding on the door, and the two drawers are open. You can see the standard type metal drawer tracks with rollers mounted on the sides of the drawers. You can use your browser’s Back button to return to the pantry cabinet.